The pair have appeared on Letterman and Conan O'Brien in the States. 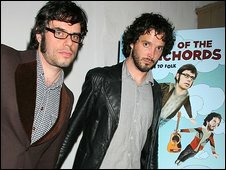 BBC Four is to screen the second series of the Emmy-nominated comedy Flight of the Conchords. The show follows New Zealanders Jemaine Clement and Bret McKenzie as they try, with little success, to launch their folk music parody act in New York. The cult programme, made by HBO, became a success on both sides of the Atlantic. An EP of music from the show won a Grammy in 2007. Series two is already airing in America and will broadcast here in spring 2009. The TV show started out as a radio show that Clement and McKenzie made for BBC Radio 2 in 2004. Having picked up a Perrier award nomination at the Edinburgh Festival the year before, the pair worked with Rob Brydon and Jimmy Carr on a six part series which followed their search for success on London's music scene. Production on series two of the television show was delayed by the writers' strike in Hollywood.